The Montagnola tholos is one of the most important Etruscan monuments of the Orientalizing period in all of northern Etruria. Explored by Giacomo Caputo in 1959, the tomb stands on the bank of the Zambra River in the Quinto Alto area near Sesto Fiorentino. The tumulus was originally delimited by a drum made up of a row of stones stuck vertically in the ground, of which a large tract remains. It contains a large circular room, a tholos, covered with a pseudo-dome, i.e., with rows of stone slabs arranged in progressively corbelled concentric rings, with a central pillar that does not seem to have had any static function. The room is accessed through a long corridor, dromos, built with large irregularly squared blocks, arranged in horizontal rows. The first part of the dromos, sloping slightly, is exposed; then, a door delimited by monolithic jambs leads to the covered dromos, along which there are two rectangular cells, also covered with a false vault. Although plundered repeatedly, numerous fragments of funerary objects have been brought to light from the tomb: among those particularly important are a foot from an ivory folding stool, ivory and bone figurines and plaquettes, small alabaster and bucchero vases. 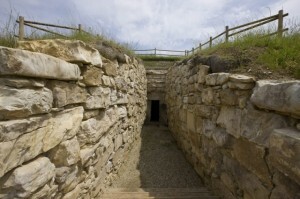 These objects allow establishing that the monument was built shortly after the middle of the 7th century B.C. and was used at least until the middle of the 6th century. With the Bologna-Florence high-speed train line passing near the tomb, it became essential that radical measures be taken regarding the tomb. 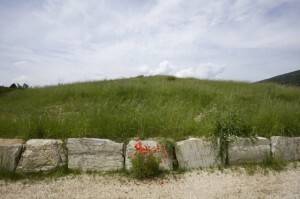 The work involved a full excavation of the tumulus, clearing away the trees that had grown or had been planted there over the years, in order to restore as much as possible, the original appearance of the tumulus as created by the Etruscans. Date: last quarter of the 7th century B.C. This tumulus typifies the Montagnola Etruscan tomb from the outside. 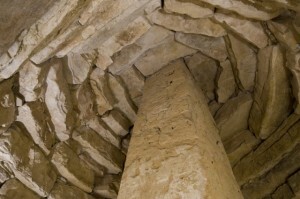 Discovered in the 1960s near Sesto Fiorentino, the tholos dates to the last quarter of the 7th century B.C. and was opened for the first time to the general public after being careful restored and reinforced. 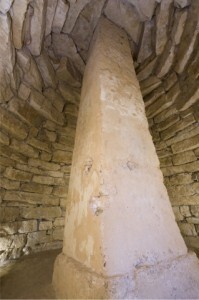 The burial chamber of the tholos has perpendicular walls about three meters high and is topped by a false dome about 5 meters in diameter. The stones are supported by a solid tapered central pillar with a square base, in calcareous tufa. The stones of the dome of the Montagnola tholos are supported by a solid tapered central pillar with a square base, in calcareous tufa. The Montagnola tomb is not open to visitors.